I have family gift ideas for you today! I had totally wanted to show you this post in December to give you a fun family gift idea for your holiday season, but our December was quite different due to the death of my Aunt. I ended up throwing things together in a box and sending them off to my family before I had a chance to really cute-ify them or photograph them for you guys. I still love the idea and think it is a fantastic family gift idea, so I put together one for my family to show you as well. At Christmas time, I really like putting together some kind of gift for our siblings rather than sending gift cards. It feels more meaningful to me and is fun to me as well. However, all of our family live all over the USA, so I also need something that packs well and won't cost an arm and a leg to ship. (affiliate link), which would be adorable to include but would add to the price of the gift and the price of shipping. 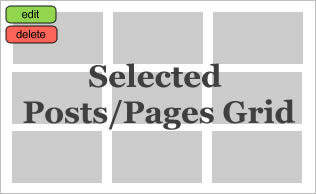 (the Jim Carey version) – both affiliate links. We thought those would be fun movies for most any age. 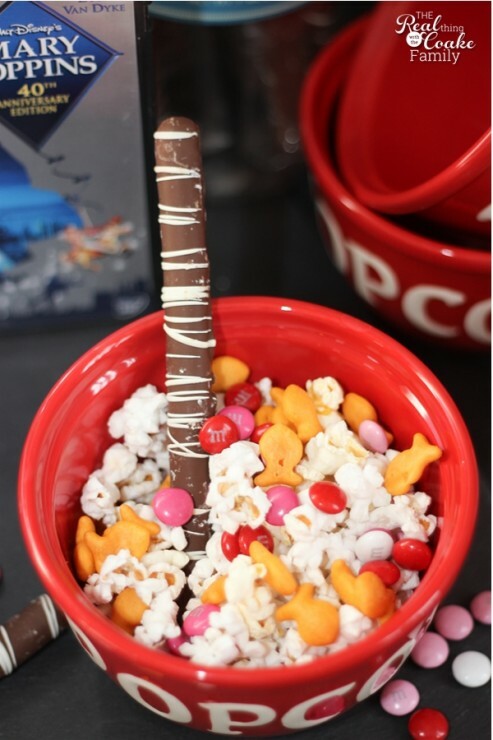 In the red bowl, I put popcorn, chocolate covered pretzels, goldfish and in this one I put M&M's. Our family got Girl Scout chocolate covered pretzels as well (from the nut sale they have in the fall). 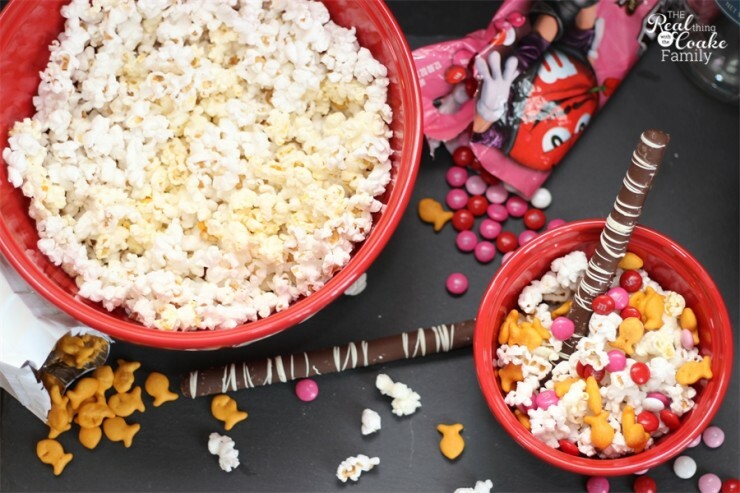 All fun things for making a family movie night just a little bit more fun. 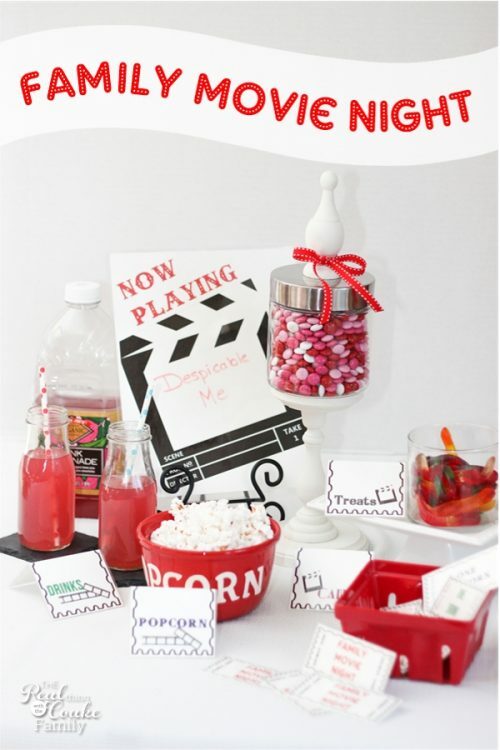 I put together cute printables for the family movie night as well. 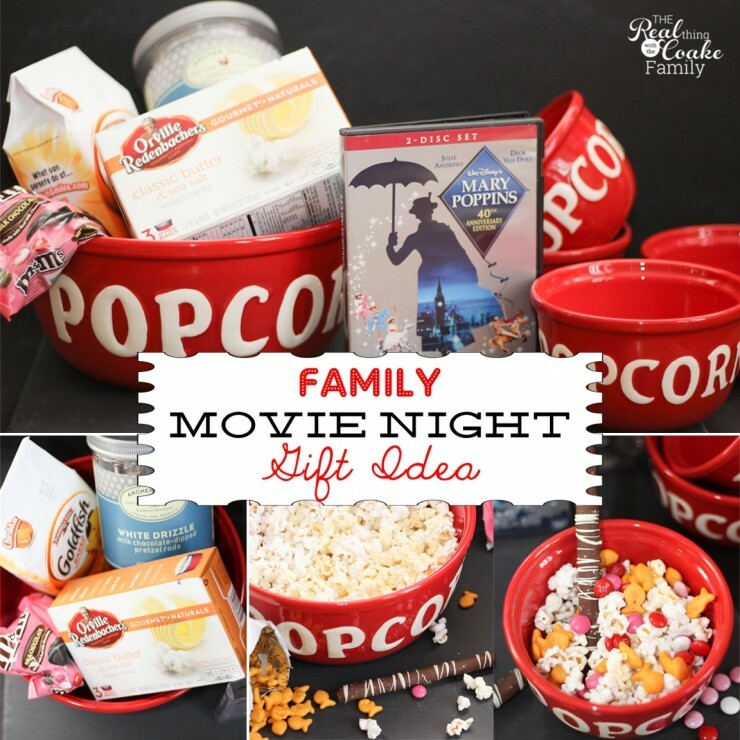 If you would like your own cute printables with your family movie night gift, you can get those by clicking below and see how I used them in the post I linked to. (Oh and if you sign up for my free member program, in the welcome email series, you will get a coupon you can use on any of the printables in my shop!) The printables will add just that extra fun touch to the gift. 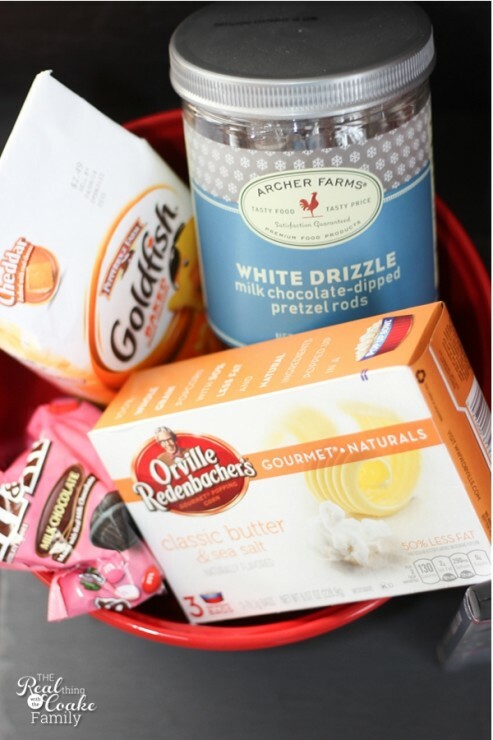 The beauty of this gift idea is that you can tailor it to any likes or dislikes or allergies. It is an easy gift to put in a basket and give or a box and ship. It is my favorite type of gift to give and receive because it is yummy and means fun time with my family! What could be better? The kitchen might be a little messy at the end from all the treats, but a yummy, fun family movie night will have been had, so it is all good in the end. What kinds of family gift ideas do you have? Do tell, I would LOVE to hear more ideas and stock a few away for this year! For even more gift inspiration, follow my Real Gift Ideas Pinterest board. Follow The Real Thing with the Coake Family's board Real Gift Ideas on Pinterest. This is a very cute idea and one that encourages family time. We are a family of snugglers so one year I gave everyone their own blanket. My in-laws were going on a trip so I made them all blankets for the plane ride. They folded up into a pillow and when unfolded they had a pocket for your book etc. 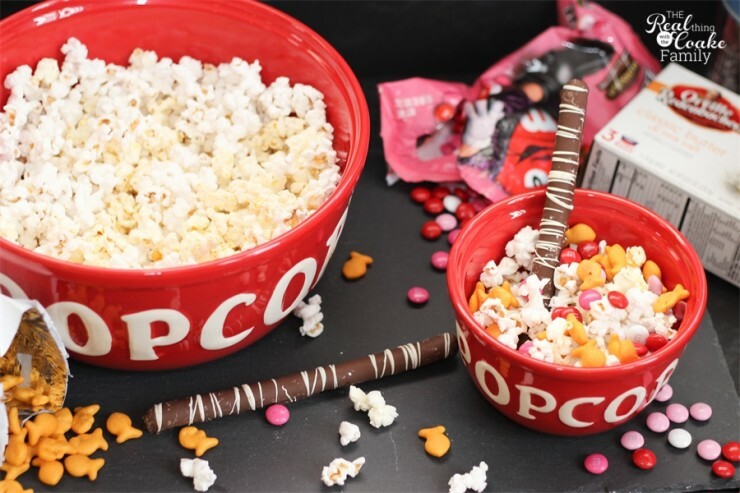 Love your popcorn bowl set. I love your idea! The blanket for a trip is such a great idea. I love gifts like that, that are personal and so wonderfully useable. I love this idea. 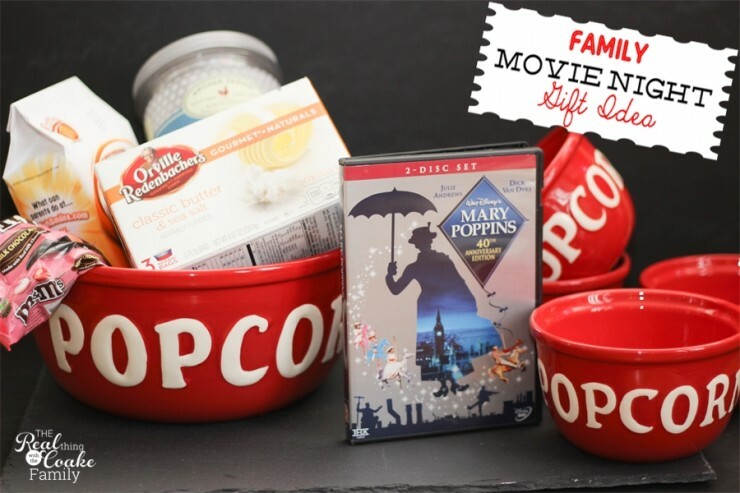 Movie night is popular in most homes, so these will make perfect Christmas gifts. Thanks for sharing on Sunday’s Best Linkup. Love this! I did something similar for a Secret Santa a few years ago – it was a hit! Thanks for sharing at Share the Wealth Sunday – we hope to see you again soon! They are great pans! Thanks! These are some wonderful gift ideas for movie lovers, like myself. I am sure that it would make them quite happy.